Acute Intermittent Porphyria is a genetic disorder of heme metabolism, characterized by increased levels of porphyrin precursors, δ-aminolevulinic acid (ALA) and porphobilinogen (PBG). ALA has been reported to generate reactive oxygen species and to cause oxidative damage to proteins, subcellular structures and DNA. It is known that oxidative stress can induce apoptosis. The aim of this work was to study the cytotoxic effect of ALA on two hepatocarcinoma cell lines. We have determined the impact of ALA on HEP G2 and HEP 3B hepatocarcinoma cell lines survival as measured by the MTT assay. ALA proved to be cytotoxic in both cell lines however; HEP G2 was more sensitive to ALA than HEP 3B. Addition of hemin or glucose diminished ALA cytotoxicity in HEP G2 cells; instead it was enhanced in HEP 3B cells. Because apoptosis is usually associated with DNA fragmentation, the DNA of ALA treated and untreated cells were analyzed. The characteristic pattern of DNA fragmentation ladders was observed in ALA treated cells. To elucidate the mechanisms of ALA induced apoptosis, we examined its effect on p53 expression. No changes in p53 mRNA levels were observed after exposure of both cell lines to ALA for 24 h. CDK2 and CDK4 protein levels were reduced after ALA treatment at physiological concentrations. Acute Intermittent Porphyria (AIP) is an autosomal dominant inherited disorder because of a partial defect in Porphobilinogen Deaminase (PBGD), the third enzyme in the heme biosynthetic pathway. As a result, the porphyrins precursors, δ-aminolevulinic acid (ALA) and Porphobilinogen (PBG) can accumulate . Furthermore, the free heme pool would decrease and adversely affect P-450 and several important antioxidant enzymes, leading to impaired hepatic detoxification reactions . Clinically, the disease is characterized by occasional acute attacks of abdominal pain and various neuropsychiatric symptoms. Several therapeutic drugs, anaesthetics and infections are considered the most frequent precipitating factors of acute attacks in the Argentinean population . Specific treatments for acute attacks include high glucose intake , hemin  and folic acid in combination with glucose . In Northern Sweden, Lithner and Wetterberg  and Hardell et al. have found a clear association between AIP and hepatocellular carcinoma, also confirmed by other authors . Moreover, ALA has been demonstrated to produce reactive oxygen species through metal-catalyzed aerobic oxidation and to cause oxidative damage to proteins, lipids and subcellular structures. Exposure of plasmid pBR322 DNA to ALA produced DNA single-strand breaks . In this study, we have examined the effect of ALA on human hepatocarcinoma HEP G2 and HEP 3B cell lines viability. Tumor cells were exposed to different ALA concentrations and ALA-S activity repressed conditions, produced by hemin or glucose addition to the medium. DNA fragmentation was also analyzed. Northern blot analysis for p53 and Western blot analysis for CDK2 and CDK4 were evaluated to determine cells sensitivity to ALA.
Hemin, ALA, 3-[4,5-dimethylthiazol-2-yl]-2,5-diphenyltetrazolium bromide and L-glutamine were obtained from Sigma Chemical Co. (St. Louis, MO). D-Glucose, PBS, Dulbeco's Modified Eagles Medium (DMEM) and antibiotics were obtained from GIBCO BRL. HEP G2 and HEP 3B cell lines (American Type Culture Collection, Rockville, MD) were derived from a human hepatocellular carcinoma [11–13]. 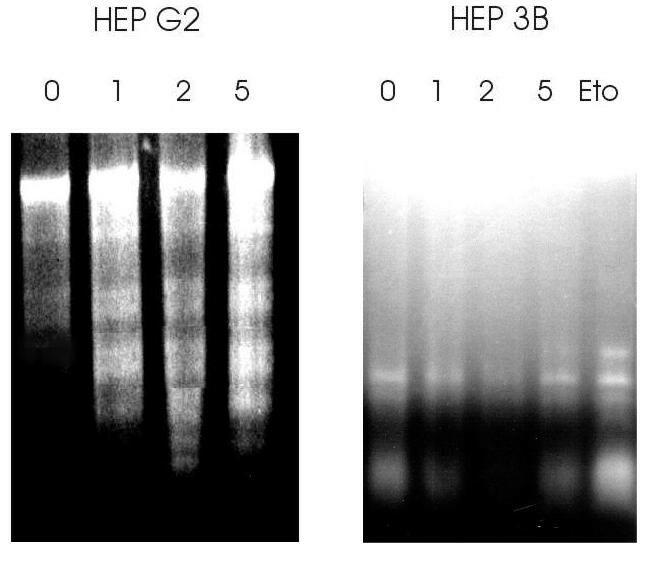 HEP G2 contained wild-type p53  and HEP 3B cells contained deleted p53. Cell lines were grown in total darkness, at 37°C in 5% CO2 atmosphere in Dulbecco's Modified Eagle Medium supplemented with 10% fetal bovine serum, 10,000 U penicillin, 10,000 μg streptomycin and 2 mM L-glutamine. After exposure to drugs, the viability was determined by the MTT assay following published procedures . Briefly, 40,000–50,000 cells in 500 μl of medium were plated onto each well of 24-well tissue culture plate. After 24 h of culture, ALA (0.5–5 mM), Hemin (8–24 μg/ml) or D-glucose (2–3 mg/ml) dissolved in PBS immediately prior to use, were added to the medium. Cells were cultured for 24 h. After exposure, the medium was aspirated and replaced with 300 μl of fresh drug-free medium containing 0.5 mg/ml (3-[4,5-dimethylthiazol-2-yl]-2,5-diphenyltetra-zolium bromide) MTT. The cells were incubated for an additional 4 h. This medium containing MTT was removed by inverting the plate and 200 μl of dimethylsulphoxide (DMSO) were then added to each well. After 10 minutes of shaking, absorbance in each well was read in a microplate reader at 570 nm. All experiments included untreated control cells, they were repeated three times and each concentration was tested in sextuplicate. Viability was expressed in terms of population growth, as percent of an untreated control population with standard error of the mean (SEM). Treated cells were grown in 75 cm3 flasks. Both attached and unattached cells were harvested, washed with PBS, resuspended in TNE solution (10 mM Tris-HCI, pH 7.6; 140 mM sodium chloride; 1 mM EDTA), and lysed at 37°C in 2 ml of extraction buffer (10 mM Tris-HCI, pH8.0; 100 mM EDTA, pH 8.0; 20 μg/ml pancreatic RNase; 0.5% SDS). After 2 h, proteinase K was added at a final concentration of 100 μg/ml and the mixture was incubated for another 3 h at 50°C. The DNA was extracted twice with equal volumes of phenol and once with chloroform. The DNA was then precipitated with 0.1 vol of sodium acetate (pH 4.8) and 2.5 vol of ethanol at -20°C overnight and pelleted at 13,000 g for 30 min. Samples were electrophoresed in 2% (w/v) agarose gel and DNA was visualized by ethidium bromide staining. Total RNA (40 μg), from exponentially growing cells treated with different concentrations of ALA (0.5–5 mM) during 24 h, was prepared by Chomsinsky and Sacchi  method, size-fractionated on 1% agarose/5% formaldehyde gels, transferred onto nylon membrane Hybond-N+ (Amersham Pharmacia Biotech), and ultraviolet cross-linked. The blots were then prehybridized and hybridized with pTRI-p53-Human or pTRI-GAPDH-Mouse (Ambion) to 65°C with Ultrahyb solution (Ambion) and washed as manufacturer described. Blots were exposed to AGFA films at -70°C and developed. cDNA probes were labeled with [α-32P]ATP (3,000 Ci/mmol) using Kleanow (Biolabs) and random primers, for 2 hours at 37°C. Intensity of bands were analysed with ImageMaster (Amersham Pharmacia Biotech). Exponentially growing cells (5 × 106/25 ml) were treated with different concentrations of ALA (0.5–5 mM). After 24 h of incubation, cells were washed with PBS and lysed in 500 μl of RIPA buffer (50 mM Tris pH 7.4; 150 mM NaCI; 20 mM EDTA pH 8; 0.1% SDS). After sonication (3 × 15 s) and 30 min incubation with PMSF (10 mg/ml) at 4°C, cell lysates were centrifuged at 10,000 g for 10 min at 4°C. Protein content of supernatants was determined by Bradford protein assay. Cell lysates containing equal amounts of protein (50 μg) were resolved on 12 % SDS-polyacrylamide gel electrophoresis (PAGE). Proteins were transferred onto nitrocellulose membranes Hybond ECL (Amersham Pharmacia Biotech) at 300 mA for 1 hour at 4°C using Towbin buffer (25 mM Tris; 192 mM glycine; 3.5 mM SDS; 10% Methanol; pH 8.3). Membranes were blocked by incubation in TBS (20 mM Tris; 137 mM NaCl; 0.05 % Tween 20; pH 7.6) containing 5% dry low fat milk for 1 hour at room temperature. 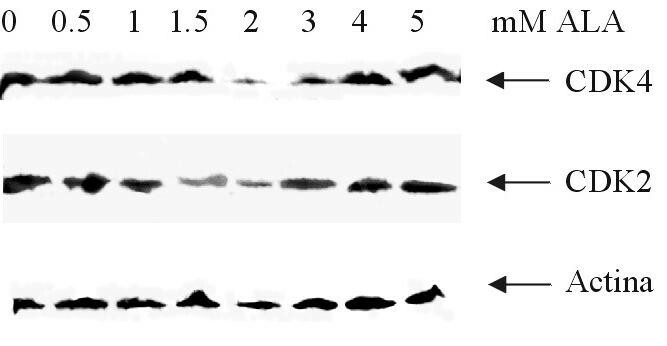 Blots were probed with either anti-CDK2 (1:300), anti-CDK4 (1:300) or anti-actin (1:100) goat polyclonal antibody (Santa Cruz Biotech, Santa Cruz, CA). Immune complexes were detected using donkey anti goat secondary antibody (1:1,500) (Santa Cruz Biotech, Santa Cruz, CA) and were visualized using ECL reagents (Amersham Pharmacia). Intensity of bands was analyzed with Image Master (Amersham Pharmacia Biotech). Human hepatocarcinoma cells were treated with various concentrations (0.5–5 mM) of ALA and the viability of cells was determined (Figure 1). ALA was toxic to both hepatocarcinoma cell lines. In HEP G2 cells, cytotoxicity occurred after exposure to 0.5 mM ALA for 24 h (growth inhibition: 30%) and the highest growth inhibition (70%) was observed with the highest ALA concentration (5 mM). HEP 3B cells were more resistant to ALA than HEP G2 cells, exhibiting only 12% growth inhibition after exposure to 0.5 mM ALA for 24 h and a 40% growth inhibition with 5 mM ALA. The strange shape of the viability curves obtained in both cases, with a restoration of control viability with 2 mM ALA, cannot be explained. Cytotoxic effects of ALA. Human hepatocarcinoma cell lines (HEP G2 (circles) HEP 3B (squares)) were grown in the absence or in the presence of increasing ALA concentrations (0.5 to 5 mM) and the viability of cells was determined by the MTT assay. Viability was expressed in terms of population growth, as percent of an untreated control population with standard error of the mean (SEM). Simultaneous treatment of the HEP G2 cells with ALA (0.5 mM) and non-toxic concentrations of hemin (8–24 μg/ml) for 24 h resulted in a significant decrease in sensitivity to ALA (Figure 2), reverting its cytotoxic effect. It is worth noting that treatment of HEP G2 cells with hemin alone stimulated cell survival (20% over control). However, the same treatment of HEP 3B (ALA and hemin) increased ALA toxicity. Hemin effect on ALA toxicity. 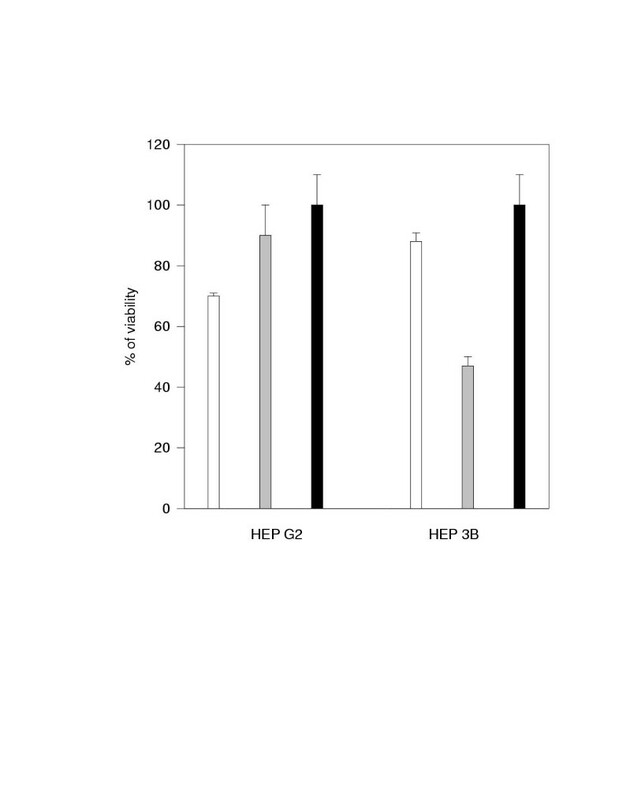 The effect of Hemin was determined by exposing HEP G2 and HEP 3B cells to 0.5 mM ALA without (white) or with 16 μg/ml Hemin (grey) for 24 h before the MTT assay was performed. Controls were grown with 16 μg/ml Hemin alone (black). Viability was expressed in terms of population growth, as percent of an untreated control population with standard error of the mean (SEM). 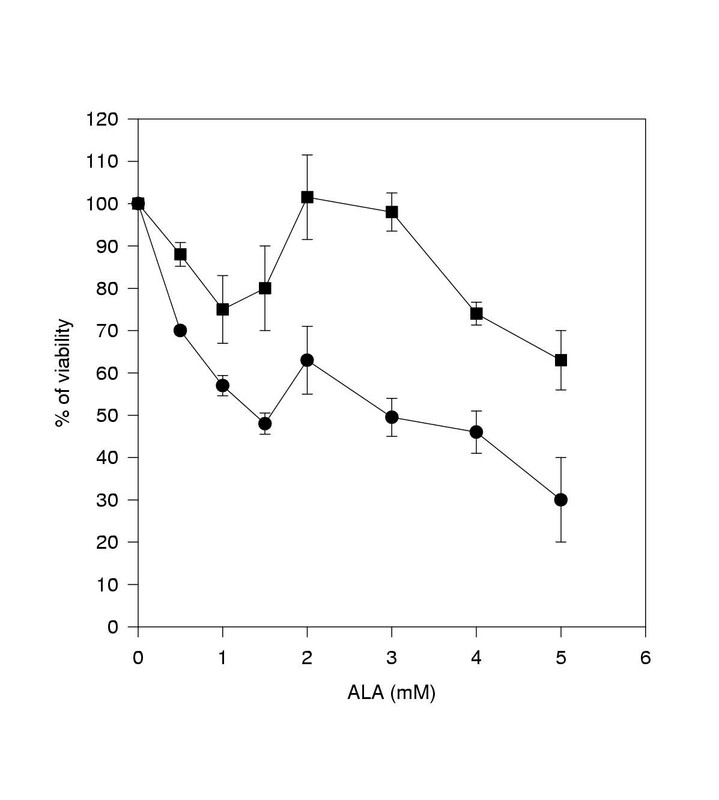 Alike hemin, simultaneous treatment of the HEP G2 cells with ALA (0.5 mM) and D-glucose (2–3 mg/ml) for 24 h resulted in about two-fold decrease in sensitivity to ALA (Figure 3). And again the same treatment of HEP 3B (ALA and D-glucose) enhanced ALA cytotoxicity. Glucose effect on ALA toxicity. The effect of Glucose was determined by exposing HEP G2 and HEP 3B cells to 0.5 mM ALA without (white) or with 2 mg/ml glucose (grey) for 24 h before the MTT assay was performed. Controls were grown with 2 mg/ml glucose alone (black). Viability was expressed in terms of population growth, as percent of an untreated control population with standard error of the mean (SEM). As shown in Figure 4a, after 24 h exposure of HEP G2 cells to ALA (1–5 mM) both attached and unattached cells were harvested. In each case, nucleosomal DNA ladders, typical of apoptosis, were visible on agarose gel after staining with ethidium bromide. When HEP 3B cells were treated under the same conditions, nucleosomal DNA ladders were much less visualized (Figure 4b). Apoptosis was also corroborated morphologically by phase contrast microscopy in both cell lines. The decrease in viability was due to cytotoxicity as observed under phase contrast microscopy. ALA caused hepatoma cells first to shrink and then gradually to become dettached, starting about 14 hours after treatment as observed by phase contrast microscopy (data not shown). DNA fragmentation analysis in human hepatocarcinoma cells undergoing ALA-induced apoptosis. HEP G2 (a) or HEP 3B (b) cells were treated with ALA (0; 1; 2 or 5 mM) and DNA fragmentation was examined 24 h later. HEP 3B cells were also treated with Etoposide (Eto, 5 μM), used as positive control. To elucidate the mechanisms of ALA causing apoptosis selectively, we have examined the effect of ALA on p53 mRNA levels. No any change in mRNA p53 levels for 24 h was observed in HEP G2 cells (Figure 5). Only at concentrations as high as 5 mM ALA, p53 mRNA expression was 25% diminished. p53 mRNA expression in HEP G2 cells under ALA treatment. Total RNA was isolated after treatment of cells with ALA (0–5 mM) during 24 h and hybridized with cDNA p53 specific probe and normalized relative to GAPDH. Intensity of bands were analysed with ImageMaster. When CDK2 and CDK4 protein levels were analyzed in HEP G2 cells after exposure to ALA for 24 h (Figure 6), both kinases decreased with increased ALA concentrations, up to 2 mM. At concentrations above 2 mM protein content increased reaching basal levels at 5 mM (Figure 6). Western blot analysis of CDK4 and CDK2. Proteins were isolated after treatment of cells with ALA (0–5 mM) during 24 h. Proteins were normalized to 50 μg per lane and the amount of CDK2 and CDK4 was detected using polyclonal antibodies and visualized using ECL reagents. Intensity of bands was analysed with ImageMaster. The heme precursor ALA accumulates under pathological conditions, such as AIP, tyrosinosis and lead poisoning, diseases often linked with increased liver cancer incidence . The reactive oxygen species generated upon ALA metal-catalyzed oxidation, promote the formation of several radical-induced base degradation products in isolated and cellular DNA . ALA is the precursor of Protoporphyrin IX (Proto IX). Exogenous ALA bypasses the feedback control and may induce Proto IX accumulation. Since heme-containing enzymes are essential for energy metabolism, every nucleated cell should have at least a minimal capacity to synthesize Proto IX and this is the rational for the use of Photodynamic Therapy . ALA proved to be cytotoxic in neuroblastoma cells. This cytotoxic effect of ALA could be diminished by heme, presumably through modulation of ALA synthesis . 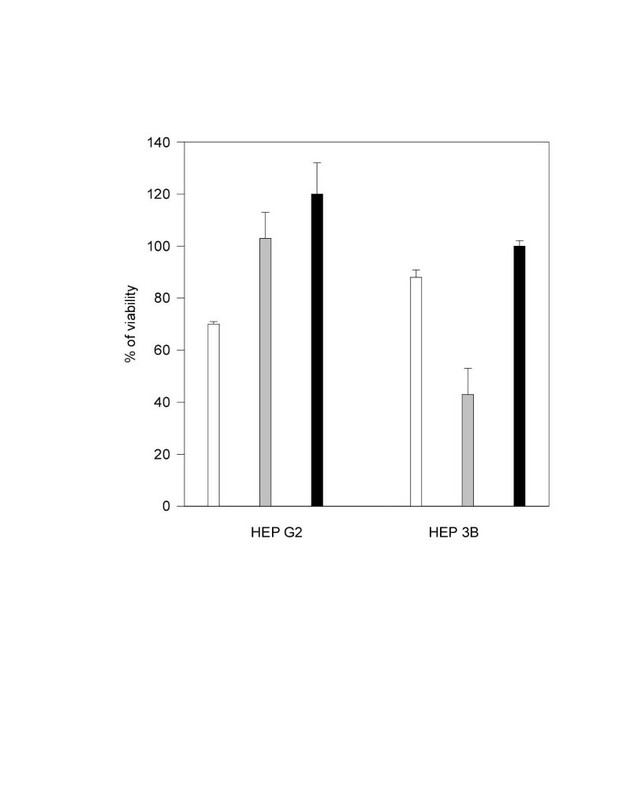 Here we have demonstrated the cytotoxic effect of ALA on two human hepatocellular carcinoma cell lines HEP G2 and HEP 3B, which was greater on the former. ALA effect would be attributed to its accumulation in HEP G2 cells, as it was shown by its reduction after simultaneous exposure with hemin or glucose, well-known repressors of ALA-S activity. There is evidence that following the exposure to external ALA, there is induction of endogenous ALA synthesis, and that ALA uptake is higher in more rapidly proliferating cells . The strange shape of the viability curves is difficult to explain within the context of these experiments and could probably be due to different ALA and/or PPIX accumulation, which will be measured in future assays. In HEP G2 cells, protection by hemin would be due to induction of the HO-1 gene, and increased formation of bilirubine, through heme degradation with its known free radicals scavenger effect [21, 22]. Glucose protection could be attributed to overcoming reduced glucose uptake provoked by ALA. ALA was reported to affect cultured chick embryo neuronal and glial cells by decreasing glucose uptake . In HEP 3B cells, treatment with ALA and hemin or glucose produced increased cytotoxicity, indicating that the mechanism of ALA action involved would certainly be different. Apoptosis is a physiological event occurring in response to multiple stimuli including growth factor withdrawal, radiation therapy and presence of chemotherapeutic agents. Several mechanisms regulate the apoptotic process, such as induction of a p53-dependent-pathway after DNA-damaging agents, modulation by the bcl2 family of proteins, and activation of some effectors including the interleukin-converting enzyme (ICE) family of proteases and endonucleases [24, 25]. Interestingly, ALA produced apoptosis visualized by DNA ladders, but its action did not appear to correlate with the p53 status; while HEP 3B p53 null cells are relatively resistant to ALA-induced apoptosis, HEP G2 p53 wild type cells are very sensitive to ALA-induced apoptosis. However, the treatment did not alter mRNA p53 levels as revealed by Northern blot analysis suggesting that apoptosis would be occurring through other mechanism, p53 independent. CDKs have been implicated as modulators of apoptosis . Some important influences that may have an impact on susceptibility to apoptosis include altered generation of reactive oxygen or nitric oxide intermediates or propensity for mitochondrial damage or protease activation. The mammalian cell cycle is controlled by sequential activation and inactivation of the CDKs family, which are activated by cyclins and inhibited by CKIs. The regulators that operate in the different phases of the cell cycle are various. In our experiments, CDK2 and CDK4 protein levels decreased with ALA treatment preventing cells proliferation. Considering that both kinases are involved in cell cycle progression, diminution of their levels would induce G1 arrest and lead to the onset of the apoptotic process. When ALA was added to the medium at supraphysiological concentrations (higher than 3 mM), the rate of death cells were so high that the measured kinases levels would only correspond to a minimal proportion of viable cells. Perhaps, these cells represent a part of the population in S phase and therefore, with high levels of the kinases necessary to duplicate. These results prompted us to speculate that ALA toxic effect would be effective only in those cells which would be able to enter in arrest and would not exert any effect on those which are cycling. Further studies are in progress to further support our hypothesis. Disruption of the regulatory system controlling G1 phase progression is a common event in human hepatocarcinogenesis. Overcoming alterations that have occurred in the G1 phase regulatory machinery may provide a novel weapon to treat hepatocellular carcinoma [ and references there in]. In summary, ALA has a markedly cytotoxic effect on hepatocarcinoma cell lines at physiological levels, which could be attributed to an enhancement of apoptosis, independent of p53 but due to inhibition of cell cycle regulators CDKs.